St. Ann's was built in 1902 to serve the 23 Catholic families in the area. Before that time, Catholics in the area attended services in Millerville. 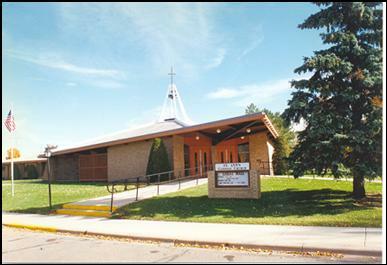 The original church was located across the street from the current structure, where a bell memorial is now located. In 2000, the parish adopted the Church of the Immaculate Conception in Barbacoas , Venezuela , as their sister parish. Since then, members of St. Ann's have traveled to Venezuela a number of times, sharing gifts of faith, hope and charity. While there, they stay with families and have established long-term relationships. Members from Barbacoas have visited here and enjoyed many attractions of Minnesota . St. Jude's Mission Circle sends suitcases filled with children's clothing and school supplies back with anyone from the diocese traveling to Venezuela . "Volunteer" is the theme of the parish, as many volunteer as teachers, lay distributors, ushers, lectors, Mass servers, flower ladies, rosary leaders, coffee and donut servers and more.